Want to know the best way to polish that old silver teapot you inherited from the Gaffer, or how to get that annoying popcorn smell out of the microwave? Join me here as I gather the best of housekeeping tips and tricks from around the Net, down the street, your Grandma’s attic, and over as far as Bree. Keep checking back, as this guide will grow! Bicarbonate, that is. This wondrous substance is your best friend! With it you can perform all kinds of housekeeping magic. Let’s start with that pesky microwave odor. Take a damp rag and sprinkle on a bit of bicarbonate of soda (baking soda). Wipe down the inside of the appliance; let sit for one or two minutes. Then fill a microwave-safe mug 2/3 full of water and squeeze in the juice of half a lemon. Set, uncovered in microwave and put settings on High for about 4 minutes. Carefully remove the mug (it’ll be hotter than you can imagine!) and wipe down the inside with a clean, wet rag. If that doesn’t get rid of the smell, nothing will! Have mineral deposits in a teakettle or double boiler? Simply fill with white vinegar and leave overnight–the calcium buildup is gone! Ever want to deal with a pesky spot in your porcelain sink without always reaching for the harsh chemicals? Try wetting the spot and covering with lemon juice. Let set, sprinkle with salt, and use a good scrubby pad to wipe that spot right outta your life. Put half a lemon down the garbage disposal and grind. Nice, fresh aroma in the kitchen! To freshen your dishwasher and remove hard water stains, place one packet of lemonade flavored Kool-Aid into the soap dispenser and run it without dishes. So you’ve just put a pan of Lembas in the oven, but you’re left with a very messing mixing bowl. Flouring the bowl before soaking it in warm soapy water will help keep the dough from sticking. Apart from making your drinks chilled, ice can be a great assistant around the house. When furniture is moved and that annoying dent stays in the carpet, if you rub an ice cube over the area to lift the pile. Then just vacuum the spot and it’s as good as new. Also,you know that oh-so-aggravating chewing gum that sticks to your shoe and you walk into the house? Rub an ice cube over the gum and it will freeze. You can then easily break it up and can remove the gum. Sugar & margarine, not just for making cakes! An inexpensive way to clean grime or oil of your hands without having to use proprietary cleaners, and kinder to your skin as well. Just place a piece of margarine and some sugar in the palm of your hand, and rub into the skin as though washing your hands. You will soon see the oil or grime start to lift. Wash with warm water and soap and bingo, clean hands. If your hands aren’t completely clean, just repeat the process. Have you have ever been frustrated after cleaning your windows? You spend time washing and drying them, only to stand back and see smears. *sigh*. Well, here is an old fashioned solution. Firstly, warm soapy water and a little elbow grease, then add vinegar to your rinsing water, finally use scrumpled up sheets of newspaper to dry them off. Hey presto!! No smears. Candles can provide much needed light and will cast a warm glow to any romantic evening but what about those annoying candle wax drips? If wax has dripped onto the tablecloth or onto your clothes don’t try to wash it out. Put the item on an ironing board or flat surface, place blotting paper underneath and on top of the item and gently iron. Start with a low heat setting on the iron and increase if needed. As the wax transfers to the blotting paper you may need to replace it. For wax drips on carpets place the blotting paper on top of the wax and iron as above. If you have a rag that is stained with blood (perhaps from cutting your finger on your sword) simply pour some hydrogen peroxide into a container (size depends on the amount of blood and size of rag) and place the raq (only stained area if possible) in the container and let it sit overnight. In the morning, rinse the rag in warm water and let it dry. To remove old wax from a glass candle holder, put it in the freezer for a few hours. Place fabric softener sheets in dresser drawers and your clothes will smell freshly washed for weeks to come. You can also do this with towels and linens. As one who seems to be accident prone in the kitchen especially around the cooker I now always keep a small bottle of Lavender Oil handy. On Christmas Day I picked up some very hot dinner plates and burned my hand. After running it under the cold water tap I liberally applied Lavender Oil and did so for a couple of hours afterwards. Result no blisters and no pain. Wonderful stuff even for spots which seem to come up at all the wrong times. Just a dab and they disappear. If you have a sunburn but have run out of After Sun Lotion – rub on some vinegar or yogurt. It helps to take the heat out of the burn. If you have trouble keeping your fingernails clean for whatever reason, brush then gently with mint toothpaste. Don’t forget to brush under the tips as well, where the germs hide. It works wonders. When cooking pasta or spaghetti there is nothing worse than seeing it form into clumps. Before you add the pasta/spahetti to the boiling water, add a few drops of oil to the pan and the pasta/spaghetti won’t stick together anymore. When cooking rice – make it extra fluffy by adding a few drops of lemon juice to the boiling water. Yummy! If like me you prefer gardening without gloves, then before you go out digging dip your fingersnails into a jar of petroleum jelly. The jelly beneath your nails stop the dirt getting in and fingernails are easier to scrub clean. Snails in the Garden Planters! I use crushed egg shells to keep the little horrors out of my plants. The snails don’t like crawling across them – well would you? Another tip “Concerning Snails” … if you don’t want them in the house – surround your air bricks, etc with thin strips of copper wire. They won’t crawl across that either! Everytime I use a banana in the house I save the skin chop it up and spread it around my plants, indoor and outdoor. There is a large store of potassium etc in the skin and the plants just love it! Have you ever had chewing gum stick to your clothes or your hair. Don’t panic. If it is on clothing – put the item in the freezer. Let it get very cold and the chewing gum will just crack off. Use a grease stain remover then wash in gentle soap powder. If it is in the hair or on the carpet – then take some ice cubes out of the freezer and place on hair etc until gum is rock solid and it will break off easily. Then wash gently. Same goes for the carpet. Nothing worse than nail varnish on clothing. Check your item of clothing carefully, and if it is not acetate or triacetate, then you are in luck. Dab the stain (from the back of the fabric) with a little non-oily varnish remover and wash in your usually detergent. Yes all you sporty people out there. Then can be horrible to remove sometimes. Gently dab the stain with methylated spirits, then wash in the usual way. Giood as new till next time! Wash it immediately in cold water. If you let the paint dry it won’t come off! Just rub when wet with household soap and then wash in the usual way. Should be good enough to go out in again! Ugh! Didn’t you know you are supposed to eat it – not get it on your clothes? Scrape off as much as you can, then sponge the stain with warm soapy water. 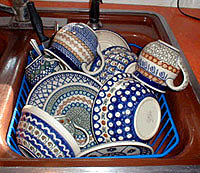 Rinse with cold water and then wash in the usual way. Should come up shiny and new. OH MY Goodness! this is brillient i am SO going to try these! Soda can do much more, you can clean many kinds of dirt away with it, use it for clean skin, white teeth, make smell go away, make better water for wahing,… There are pages on the internet about that. Oh, and itÂ´s pretty useful when youÂ´re cooking or want to make a lemonade in summer.